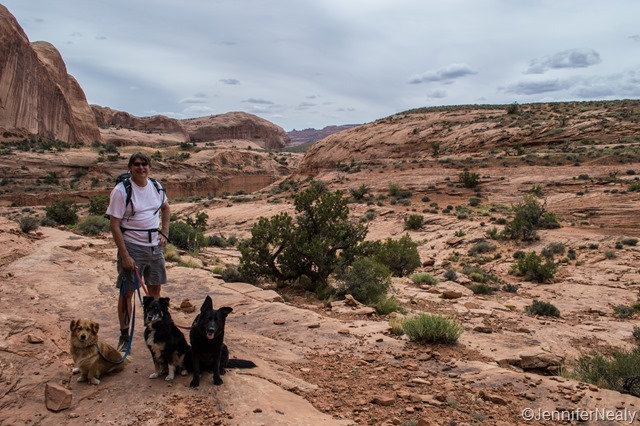 As much as we loved our day visiting Arches National Park, we knew Moab had a lot more to offer. 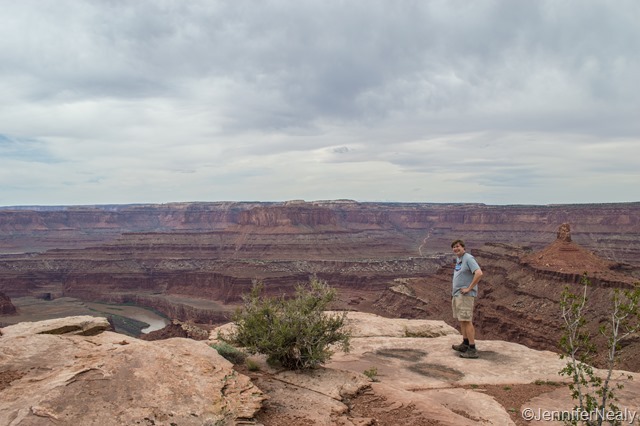 We spent our second day exploring Deadhorse Point State Park, which was about a 30 minute drive outside of Moab. 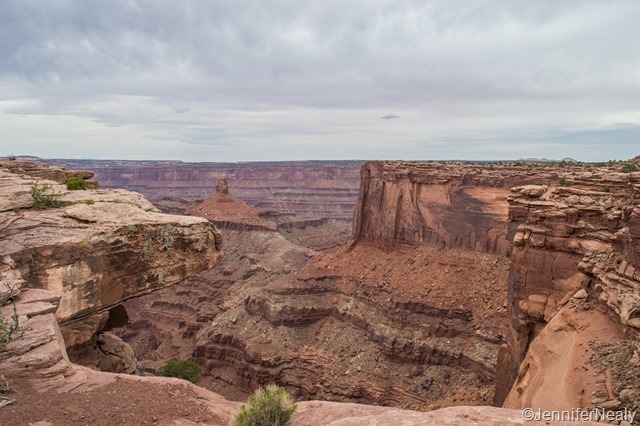 One of the features of the park is a peninsula of rock above sheer sandstone cliffs. 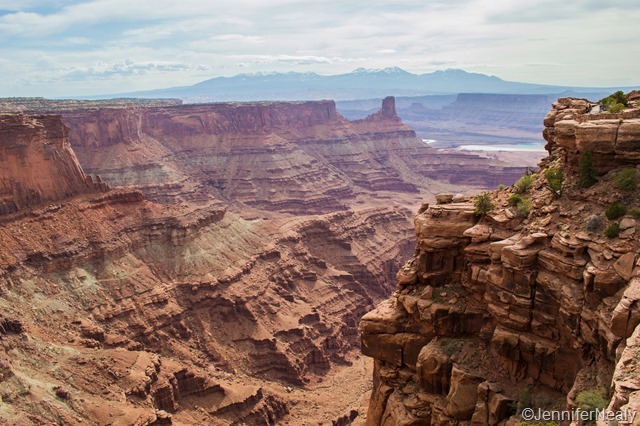 Around the turn of the century, cowboys used to round up wild mustangs and corral them onto this point, which provided natural barriers as the horses obviously wouldn’t go over the cliffs. They would then select the horses they wanted and let the others go free. But local legend is that at least once the cowboys left the unwanted horses stranded, where they died of thirst. 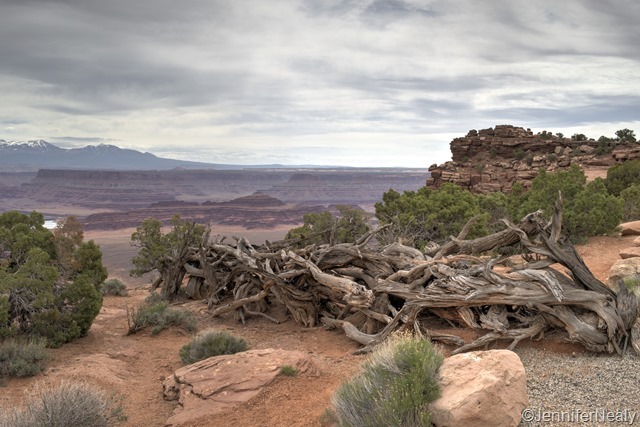 Hence the name Deadhorse Point. 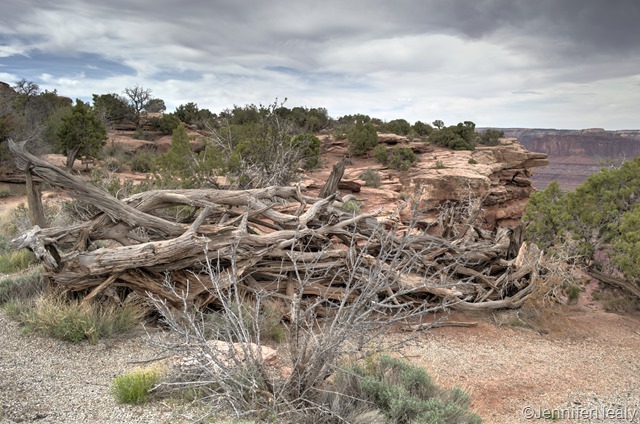 There are several hiking trails in the park, and we hiked the East Rim Trail which is 3 miles round trip, and runs from the visitor center to Deadhorse Point. The scenery was breathtaking. Towards the end of the trail as you walk out onto the point, you can see the remnants of the fence the cowboys used to keep the mustangs corralled on the point. Do you remember the scene in Thelma & Louise where they drove off the cliff at the end of the movie? Well, that scene was filmed in this park! You can see the Colorado River on the right side of this photo. 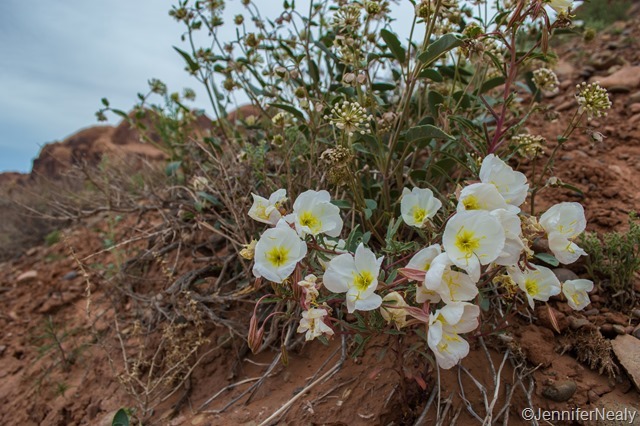 The following day we chose a 3-mile hike to the Corona and Bowtie Arches. 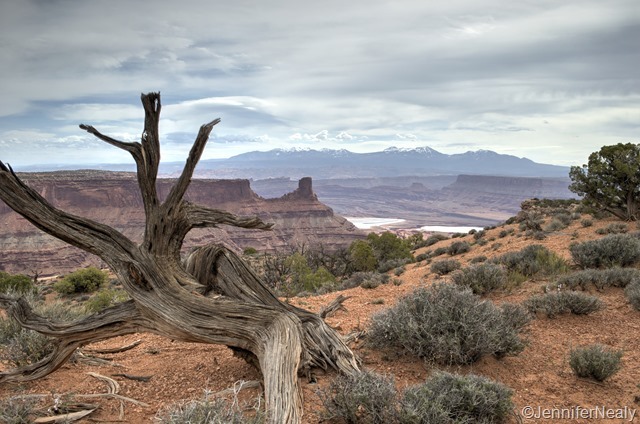 The trailhead is only about 15 miles from Moab, off of Potash Road. The first part of the trail is very easy and well-marked, and after a little over a mile we got a view of the arches. 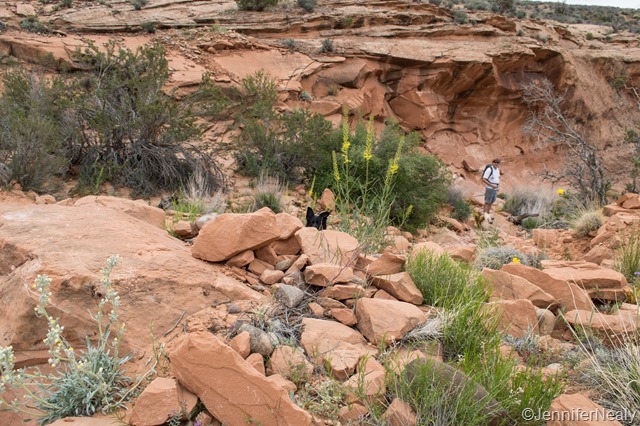 We continued along the trail towards the arches. 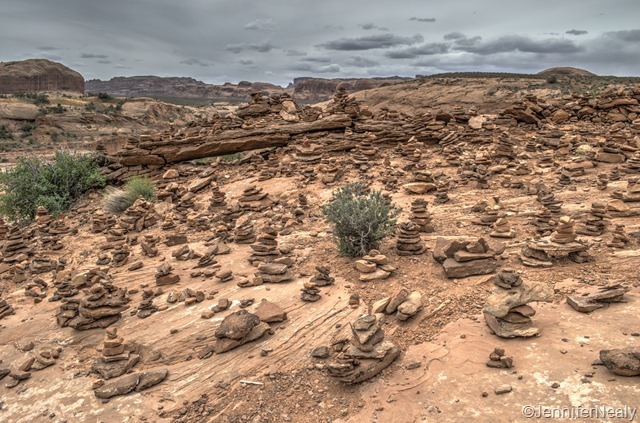 After a little while we came to a huge collection of cairns, which I found quite interesting. There must have been over 100 of them! 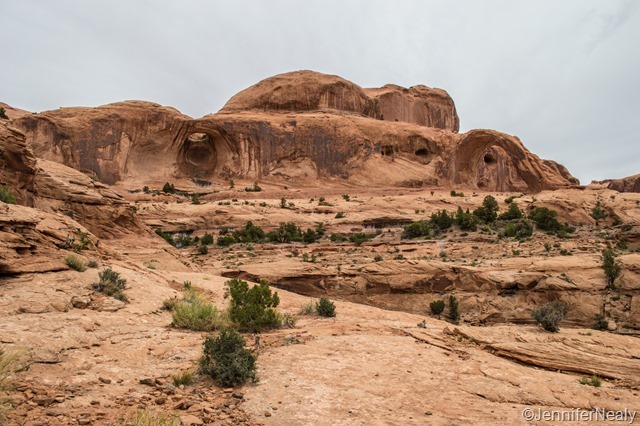 As we got closer to the arches, we discovered that the trail had a very steep section over slick rock, where you had to hold onto steel cables in order to ascend. Since we had the dogs with us, we elected to stop at this point. We saw several other people doing it quite easily, but with at least one very clumsy dog, we decided it probably wasn’t the best idea for us to continue. The trail was still lots of fun and very pretty, even though we had to cut it a little short. 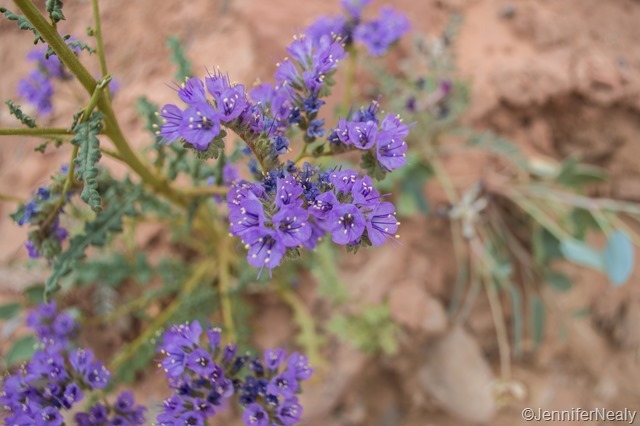 There were lots of pretty wildflowers blooming. 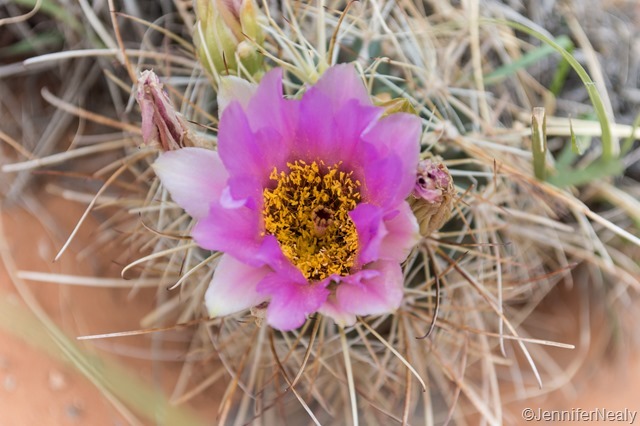 There’s just something about a flower in the desert that begs to be photographed. This next picture cracks me up – I was walking to slow for Deas (on account of all the flower-picture-taking), so he had walked ahead of me with the dogs. Nikki (our black German Shepherd) doesn’t like it when the pack separates, so if we get too far away from each other she keeps trying to run back and forth between us. We really don’t ever let any of the dogs off-leash, but Deas dropped her leash to let her run back to me. I looked up from taking pictures and saw her peeking at me over the rocks. 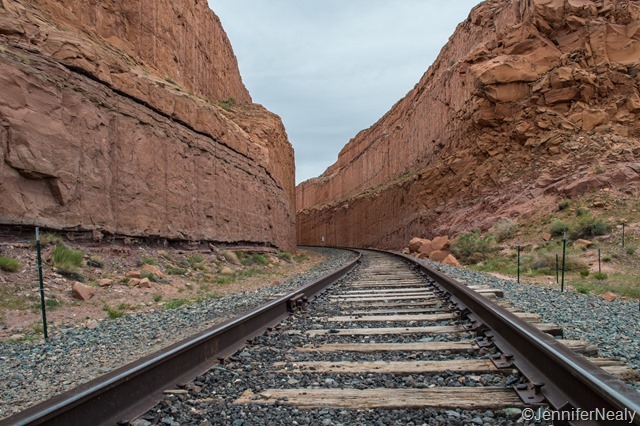 The beginning and end of the trail goes over an active railroad track. I was hoping that we would see a train pass at some point, but no such luck. 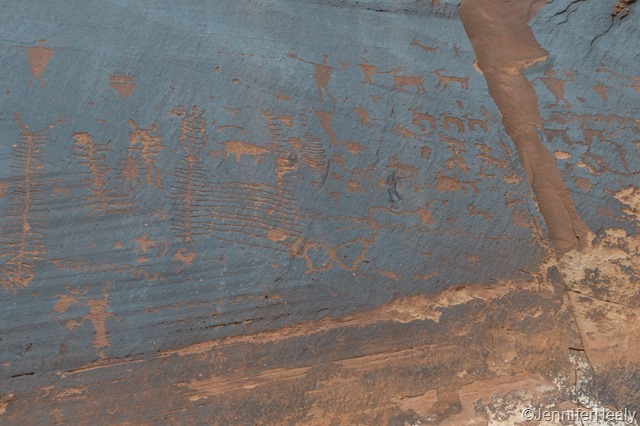 As we were leaving the trail and driving back down Potash Road, I saw a sign for Indian Drawings, so we pulled over. 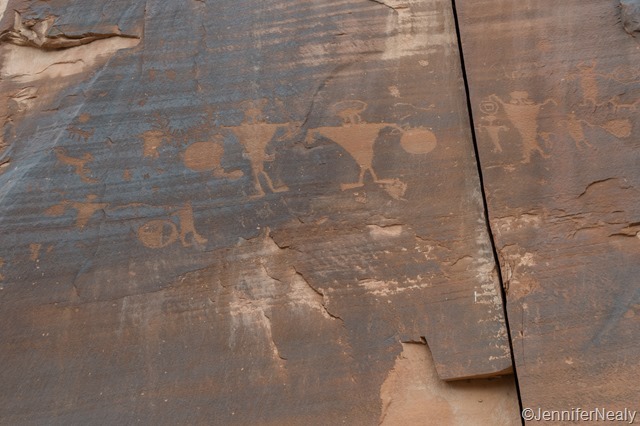 There were several easy to spot petroglyphs on the rocks right alongside the road. 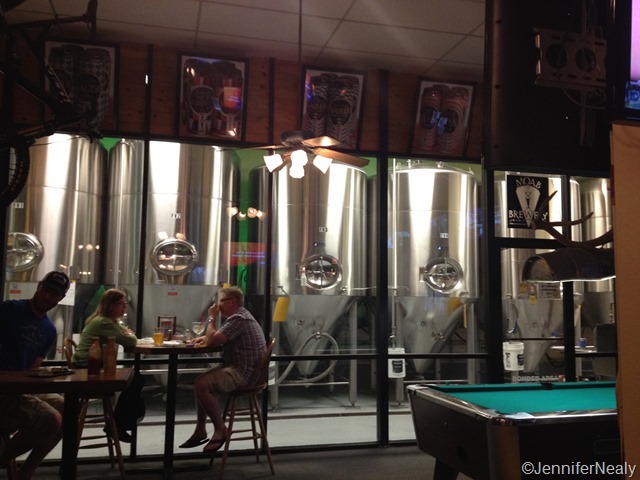 We did get into the town of Moab one night and had dinner at the Moab Brewery. After a couple of thirst-quenching draft beers and a yummy meal, we left very satisfied and wishing we weren’t leaving town so soon. We originally planned to stay a week, but found out that our friends Hans & Lisa would be camping just a few hours away. So we decided to move on so we could arrange a get together with them one night. But we will definitely be back to Moab one day! 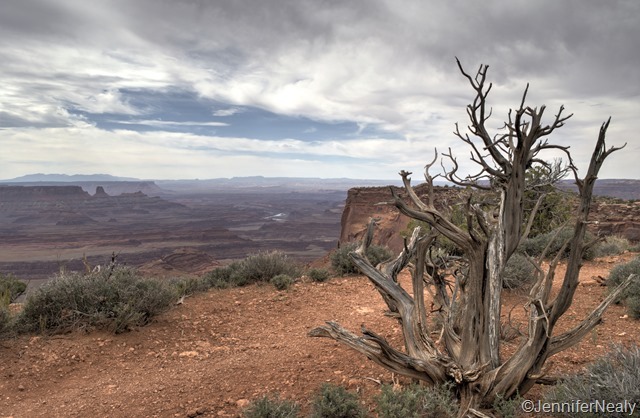 Never been to Dead Horse Point, looks like Grand Canyon without the crowds! Love the shot of Nikki being her watchful/protective self! Yes, we thought the same thing! We actually thought it was even prettier than the Grand Canyon. And definitely less people – we only saw 4 people on the whole hike. There’s a campground there too which was pretty nice. And yes Nikki is always keeping us in line! Hi KB! We’re having a great time and seeing some pretty stuff – but I still really miss 30A! Yes definitely visit Deadhorse when you return! You can also camp there – we drove through the campground and it was very pretty. There were other hikes besides the one we did, and a very popular bike trail as well. 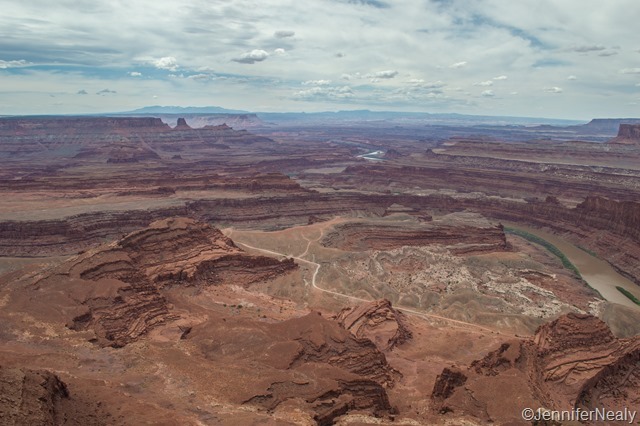 We loved Moab so much – we’ll definitely be returning one day also! Yes I just commented on your previous post about Moab! I’m jealous you’re back there – I wish we had spent more time there. Moab Brewery was great! It was shocking very crowded, even early when we went (around 5:30.) 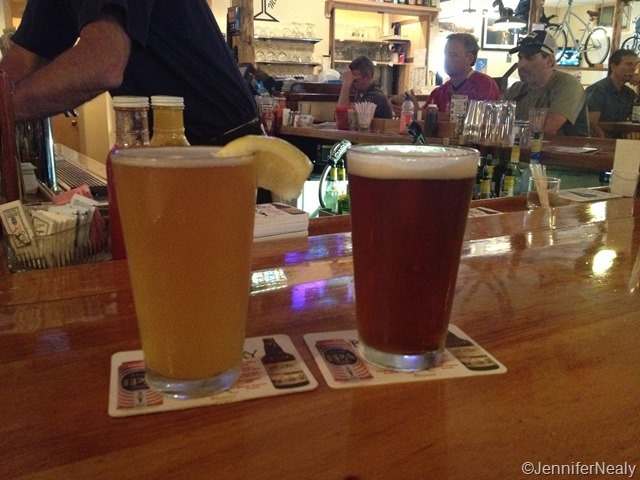 We just sat in the bar though – we didn’t ask for a table. I hope you enjoy it as much as we did! Thank you! We’re really enjoying Utah. We’ve got about one more week left and then we’ll head into Wyoming next.